The proposals in the President’s recent budget represent the most significant threats to the federal nutrition safety net in decades. 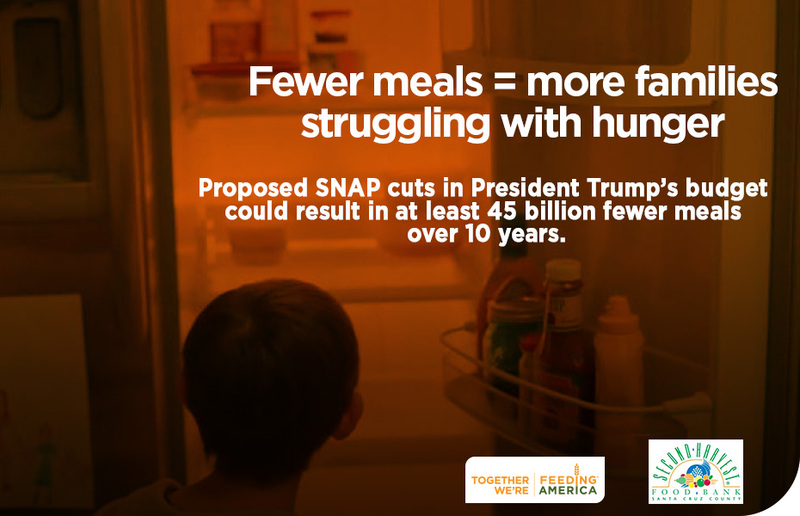 His cuts to nutrition programs would cause the loss of at least 45 billion meals over 10 years across the country. Food banks like Second Harvest keep thousands in our communities from going hungry, but SNAP/CalFresh (formerly known as food stamps) is the first line of defense against hunger—food banks could not possibly provide the meals that this budget would eliminate. Our response at this moment is critical to make it clear that such proposals will not be acceptable as Congress begins their FY18 budget process. So let your congressional office know that federal nutrition programs are critical and that you strongly oppose any cuts to them. If you live in Santa Cruz County, chances are that your Congressman is Rep. Jimmy Panetta. You can send an email or, even better, call his D.C. office at 202-225-2861. You don’t need to be an expert on the subject; he just needs to know you stand behind him on this issue. Let Representative Panetta know you’re one more citizen opposed to cuts to the SNAP program which would devastate struggling families by taking food off the table for many of our region’s kids, seniors, disabled, and working poor. Let him know how important it is to convince key colleagues that any cuts to SNAP shred the first line of defense against hunger and put a burden on food banks that far outstrips their ability to respond. you can look them up here!